South Africa’s top editorial cartoonists have banded together to protest against the government’s intended press restrictions. In rejecting the proposed Protection of Information Bill and Media Tribunal, they have warned that these restrictions will erode the right to freedom of expression achieved by the country’s hard fought struggle for democracy. 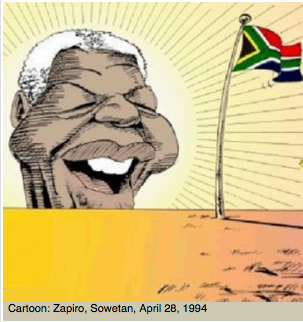 The Sowetan newspaper and Museum Africa in Newtown, Johannesburg, will be hosting an exhibition titled "Cartoons in Context" which will showcase a selection of old and new political cartoons by some of the country's top editorial cartoonists. Accompanying text and images will take viewers on a journey through South African history, spanning 200 years since the late 1700s. Corrupt politicians, dodgy business persons and lazy public servants will all benefit from at least a partial reprieve from local cartoonists who have shifted their focus towards the Soccer World Cup, and joined the rest of South Africa in a mood of patriotic goodwill. To the Stellenbosch launch of 'Don't Joke!' The Year in Cartoons on Thurs, 15th April, 2010, 17h30 for 16h00 at the Visual Arts Department, Victoria St, University of Stellenbosch. 'Don't Joke! The Year in Cartoons' - the inaugural annual of South African editorial cartoons - has sold so well since it was launched last December that the book's publishers, Jacana Media, have ordered a reprint in anticipation of stocks running out in two month's time. Book review by Francois Verster (Bolander Newspaper).